The aim of the General Data Protection Regulation (GDPR) is to improve the privacy and safety of EU residents. The GDPR strives to modernize and harmonize the legislative landscape around data protection within the European Union, because currently there is a great deal of uncertainty about it. The GDPR replaces the EU Data Protection Directive 95/46/ec, which came into effect in 1995. In the meantime, due to a developing digital landscape this legislation became no longer sufficient. Because GDPR is a regulation and not a directive, it is important to take into account that, when the regulation comes into effect in May 2018, it also fully applies as legislation for every EU member state. Countries therefore do not have to introduce separate legislation. 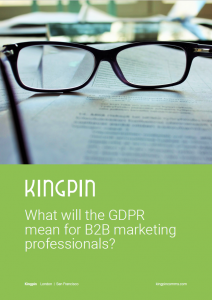 In this e-book you will find out what the GDPR means for you as a B2B marketing professional. Download the e-book ‘What will the GDPR mean for B2B marketing professionals?’ by filling in the form on the right. e-Book: What does GDPR legislation mean for B2B marketing professionals?